Signs by Van is and has been the premier custom sign company for all of your signage needs in Carmel. We are a firm believer that the proof of quality is in your portfolio. Signs by Van’s work can be seen all over Central California and throughout the United States. We encourage our new clients to do your research, visit the sign shop, and meet the people who are responsible for branding your logo for your business frontage. Our shop is open to clients and visitors – come visit and watch the process in person! Carmel is known for its natural beauty and its reputation as an artists colony. From Jack London to Clint Eastwood, artists of all stripes have called this beachside community home. These artists and generations of dedicated environmentalists have worked to protect its natural assets. Visitors from all over the world come to Carmel to explore the white-sand beaches, the trendy boutiques, and to dine at the amazing restaurants or shop at the farmers’ markets. Help your business stand out to locals and visitors alike with a custom business sign from Signs by Van. Unfortunately, in this day and age, the word “Custom” is thrown around to add value to a product that in most cases, is a “cookie cutter” product. 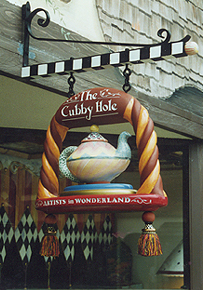 Signs by Van provides an award winning design and custom sign fabrication team that truly understands that time and effort spent on concept and design, will make the difference in your final product. We feel that it is important that 95% of all final products are made in-house by local artists and our local affiliates – not outsourced out of state! When you order a custom business sign from Signs by Van, you’ll be getting the care, attention, and workmanship that time and experience has brought to our talented sign makers. Signs of the Times and Sign Builder Illustrated are international publications dedicated to the advancement of state of the art sign industry standards and innovation in compelling signage. Signs by Van is constantly approached by these publications for new and upcoming projects. We are partnered with sign material powerhouse Duna USA who have made us their flagship company for the advancement of their products. 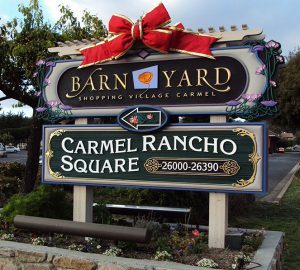 The signs that we build in Carmel are of the highest quality and are expected to last and age with grace. Signs by Van offers; Sandblasted Signs, Routed Signs, Electrical Signs, Metal Signs, Murals, Carved Signs, Personal Signs, Design, Gold Leafing, Business Signs, Winery Signs, Restaurant Signs, Agricultural Signs, Large Scale Signage, Iron and Bracket Fabrication, Wedding Décor, City Permit Services and many other boutique services in Carmel. Signs by Van plays a huge part in supporting our local companies and charities both financially and in manpower support. We know that our clients here in Carmel have benefited greatly from the professional attention we input into every project.